Safety should always be on the minds of a car owner but that doesn’t always happen. What is perhaps much more important is cost. Even economy cars will put a major dent in somebody’s wallet, and being able to squeeze as much return on investment as practicable is something every car owner should consider. There are some ways that can be used to see to it that tires and brakes don’t wear out that quickly. It is definitely a situation where an ounce of prevention is worth a pound of major repair. 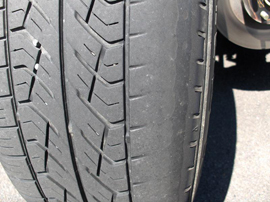 Reducing wear on tires can be as simple as making sure that they are inflated to the proper air pressure. A label can be found on the interior of the driver’s door which gives the proper pressure figure, and the owner’s manual of the car may also provide the information. It is important that the pressure of a tire be not the too high nor too low. Tire rotation, periodically switching the rear tires to the front and vice versa, will slow down the rate of wear on the tire. Sharp cornering may appear to be very racy but it wreaks havoc on the outer edges of any tire and must be avoided. Drivers should also keep in mind that weather conditions do play a role in the life of a tire. Consequently, slower driving in the winter is the best idea and being careful over rough terrain can add a few extra years on the life of tire. because of the safety factor involved. This is where a car owner can make a difference simply by not keeping a lot of weight in the trunk of the car. The reason is that the more a car is weighed down by excess baggage, the greater the stress will be on the brakes. Driving style is also something that has an impact. It is understandable to drive at high rates of speed on an interstate highway; there are few if any stops. However, someone who continually goes over the speed limit in urban areas will stress the brakes when it comes time to make a stop. Obeying the speed limit within city limits is a great way to extend a few months of the life of the brakes. When it is safely possible to do it, coasting to a stop can keep the pressure off of the brakes. Incidentally, brakes do have an influence on a tire wearing down. Too much pressure on the brakes can cause trouble for the treads on the tire. 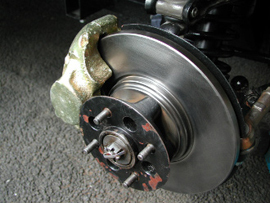 As often as possible, the brakes should be applied very lightly until the stop actually occurs. A driver should be alert to any warning signals. One that immediately telegraphs the brakes are starting to wear down is a squealing sound occurring whenever the brakes are applied. Whining noises from the tires can also suggest that the treads are starting to wear a little thin. These signals can tell a car owner that it’s time to either rotate the tires or if necessary buy new ones (depending on the model of the tire, some of these can last for 50,000 miles. That is anywhere from 5 to 7 years depending on the number of miles per year the car is driven). If the pads on the brakes are thin, it is time to have them replaced. This is not something that can be delayed because of potential safety hazards. As mentioned earlier, it often happens that driving style of the car owner will be a very important determinant of wear on both tires and brakes. Sensible driving habits will extend the life of either of these important components of a car. Cost of major repairs can certainly be avoided just by being vigilant to the warning signs. The routine maintenance of car is not that difficult or expensive. In the case of the tires a driver can add more air at any gas station, and new tires do not have to be purchased if tire rotation will take care of the problem. Brake fluid that needs to be changed by a professional service center is not going to break the family budget. So much of the prevention is simple common sense. The primary idea is to get as much return on the initial investment as is possible.